Long, long ago, way.. way back in 2016, a client who inherited this Captains desk from his father, asked me to take the piece into my shop and spruce it up a bit. I cannot image the places it has been. It was not signed and there was nothing in its construction to allow me to confidently give an accurate estimate. My seat-of-the-pants guess is early half of the nineteenth century just because all the boards were obviously milled and worked by hand. I could be, and probably am, wrong. Instantly the yellow, crazed surface becomes clear when redissolved. So, the first and most obvious problem was that the finish was riddled with tiny cracks giving the whole surface a yellow cloudy appearance. The topmost finish was not original to the piece, but it was still very old and had become so brittle that just about everything left yellow scratches on it. 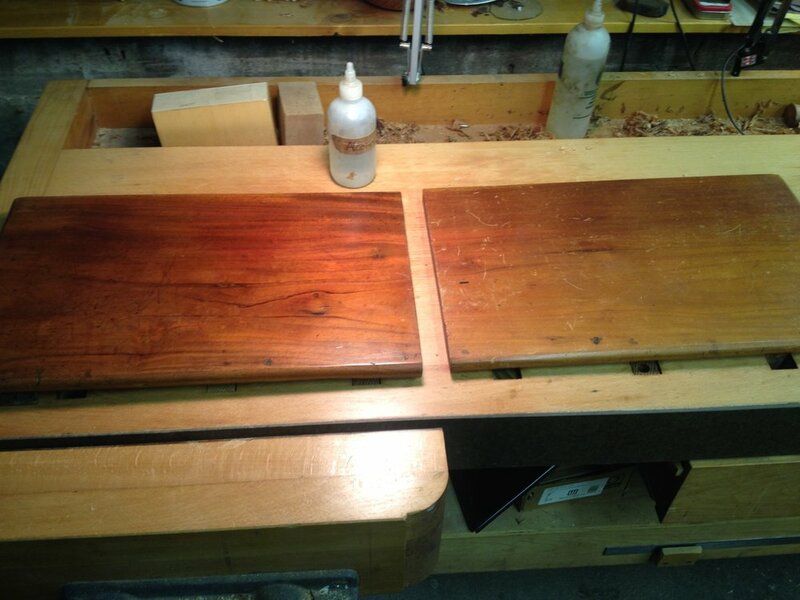 I did some experimenting with various chemicals and decided that I would repair the existing finish rather than completely remove it and refinish. The truth is that it was probably more work than merely refinishing it, however I think it was the right move. This way, the original oil and wax finish was left intact along with all the accidental damage imprinted on it as the years passed. It was charming in this case and would have been wrong to simply erase. With the right mixture of solvents and some fresh shellac to restore the integrity of the finish, all the cracks melted together and the dried film was flexible enough to prevent them from showing up. It took weeks to dry completely but once it did, the whole surface was clear and resilient. In addition to the finishing stuff, I also reglued some cracks which the drawer frames had caused. The desk must have been made either when the wood was still wet, or at least in a much more humid environment than New Jersey in the winter time (very dry). Some careful chiseling of the drawer frame's rear joints will allow for the wood to expand in the future without blasting out the sides of the desk again.. or, more accurately, allow the sides to blast themselves out when they shrink each winter. Finally, the potential coolest part of this desk was missing. Originally it had little trays to help organize the things inside but at some point they went missing. "No matter I will make new ones!" I said, and to my delight, my client said "Ok Mickey! Lets do it." These parts will be the top trays. The sides will be spanish cedar and the bottoms, mahogany. Here are the trays all finished. They are able to slide forward and back in order to access the things beneath and the dividers are able to be reconfigured as well. Before and after photos of the whole desk are right here. Enjoy and thanks for the interest!